This is a remarkable debut novel about abducted kids. Carey Violet Blackburn has lived most of her short life in a camper van deep in the woods, the last six years raising her baby sister Jenessa who has communication difficulties. Their mother, missing over two months already, is a crystal meth addict who ran off with her daughter Carey from the father when she was four and hid her deep in the Obed Wild and Scenic River National Park, Tenessee. She is not a good role model in this story. Carey has never known anything other than surviving, starving, hunting squirrels for meat and raising her little sister ‘right’. Carey is no trailer trash kid. She’s been keeping up with her schoolbooks; learning the violin and dedicated herself to home schooling Nessie as well as she can, teaching her reading, writing and arithmetic. But her crazy Mama’s been gone so long, they’re almost out of food, living on beans and luck, mostly luck. We learn one of Carey’s secrets. When her Mama used to come back, it was usually with a man on the promise he’d get Carey too. That this happens is tragic, but abuse runs deep in this story and some parents might be a little uncomfortable with exposing younger minds to it. Nevertheless that Carey has against all odds remained sane and so well adjusted and protective of her little sister is remarkable and she is an excellent role model. However there is another secret is burning away in Carey’s mind and she knows if she ever reveals it will be the end of her. She has learned to pray to St Joseph for protection. Strangers arrive in the woods. Carey is hiding but Nessa reveals herself and Carey has to rescue her. Maybe the church folk sent them. Maybe they met Mama in town, buskin' for money for her next fix. But the stranger is Mrs Haskell from Child Services. Seems they have a note from their Mama with their location and a plea to look after them. They are about to be handed over over to man who claims to be Carey’s father. (Jenessa's is unknown). All Carey knows is that is the man her Mama fled after he beat them both. She is wary and yet scared of rejection. Worse, her father has a stepdaughter called Delaney who hates Carey on sight. Luckily Nessa loves the new home and falls for their three-legged dog. Carey decides not to run off purely for Nessa’s sake. Her father remarried Melissa and they are kind to the kids, doing their best to reintroduced them to 'civilisation' but it hard for Carey to fit in. She begins to discover that their Mama may not have been telling the truth all the time. The pleasures of watching Nessa discover shampoo and toothpaste and hot showers is delightful. Carey is learning how to surrender caring for her little sister. Find herself even. Will Nessa ever speak? What is the terrible trauma that stopped her speaking? Who made the terrible scars on their backs and how will Carey have the courage to go to school? She is terrified of being found out of being considered backward. (Even though she tests at least a year above her age thanks to all her old schoolbook learning in the woods). She is scared of never making friends and Delaney makes is even more difficult for her at school. Two girls raised in the woods learning to adapt to people, noise, cell phones, ‘boys’ and above all food. Nessa keeps staring at the larder in total wonder. But the longer Carey waits to reveal her terrible secret the harder it will be and it is a heartbreaker. 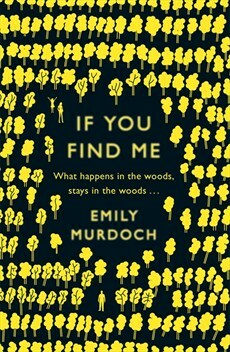 This is a remarkable tale told by Emily Murdoch and compelling reading. Could two girls raised like wolves be this smart and wise? One would like to think so. Quite a stunning debut novel.